An ever-growing weight of scientific research suggests large reductions in carbon emissions are needed to avoid drastic economic and social consequences. Maarten Bloemen, executive vice president, portfolio manager, Templeton Global Equity Group, believes investors are in a position where they could drive these changes. He explains his reasons why, and where he sees potential investment opportunities. Most climate scientists across the globe seem to agree that the effects of global warming are far reaching and that a large proportion of the blame can be placed on humans.1 According to many scientific reports, global warming is leading to rising sea levels, species loss and extinction, and the increased frequency of extreme weather events. While scientists (and governments) continue to debate potential solutions, we believe the most important force for tackling what many regard as a looming climate crisis may be in the way we invest. Businesses can play a pivotal role in solving some of these large-scale, climate-related issues. In our view, company decisions influenced by climate change are not only good for the environment, but are good for the bottom line as well. There will be many winners and losers along the way and we think there is a need for in-depth analysis of companies to differentiate between them. There will likely be operational consequences for businesses that take climate change into consideration, so it will affect their bottom line. This could potentially lead to supply-chain disruption and product obsolescence (such as petrol cars), yet at the same time, there’s potential for some significant upside opportunities in clean technology. We think our bottom-up stockpicking approach lends itself to making the differentiation between the potential winners and losers. As more investors realise the long-term implications of climate change in investing, we think it’s likely we’ll see a shift in the way capital is allocated in the global economy. As a result, we’re optimistic that humanity’s survival instinct could align towards climate change solutions for the future. According to the latest Intergovernmental Panel on Climate Change (IPCC) report, limiting average global warming to an increase of 1.5℃ above the pre-industrial era average could have a significant influence on the future environment. In particular, the report suggests that achieving that smaller warming increase would make a number of devastating climate change impacts less likely. Curbing an increase in global temperature requires unprecedented changes in the attitudes of countries and businesses to the environment, and that starts with a reduction in carbon emissions. 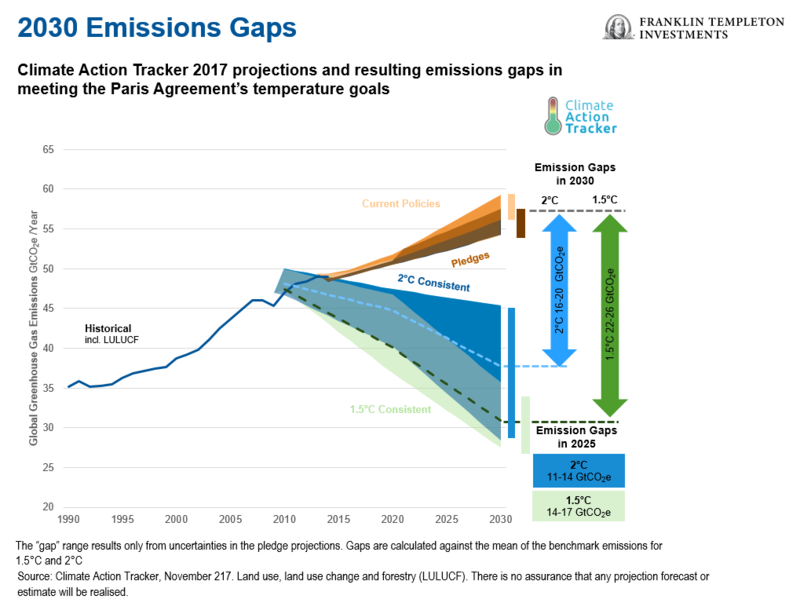 The chart below shows a stark example of what carbon reduction is needed if we are to achieve the Conference of the Parties’ COP21 objectives of limiting global warming to 1.5°C or 2°C above pre-industrial levels. The level of global greenhouse gas emissions needs to be far lower than as it currently stands or where they are projected to be. As an increasing number of companies look to reduce carbon emissions, we think some climate-change solutions these companies propose could power a general shift towards clean energy that could curb rising greenhouse gas emissions. With that in mind, building new and unsubsidised renewable energy infrastructure is now far cheaper in certain parts of the world, such as in India. Our research tells us wind and solar is now far cheaper than coal or gas. It has taken the right regulatory framework and financial incentive to reach this point in a global journey to cleaner energy. In our view, enlightened policy leadership will remain a critical part of the climate solution. We think companies actively trying to meet realistic emission-reduction targets that are grounded in science could create potential opportunities for value investors like us. Especially companies that are transitioning to a lower-carbon economy. Our bottom-up approach means we tend to favour companies that are both fundamentally undervalued and prepared for the global transition to a lower-carbon future, giving us reason to believe a company’s environmental stewardship correlates with its financial health. Climate-change solutions—solar panels and wind turbine manufacturers which provide clean and renewable energy. Companies in transition—energy companies reducing their contribution to global warming by switching from non-renewable to renewable energy sources. Transition-resilient—companies with low carbon intensity, or little exposure to carbon-intensive sectors such as retailers, bio-pharmaceuticals and telecommunications firms. We think some of the greatest contributors to reducing global climate-change risk will likely be traditional companies implementing changes in their operations, supply chains and product life-cycles. As active managers, we use extra environmental, social and governance (ESG) analysis as part of our climate-led investment process. But, we are realistic about the challenge that lies ahead. In our experience, identifying climate solutions in corporate ESG disclosures can be challenging. Some reports contain backward-looking information that can be at least a year old and may not present companies as they currently stand. As a result, this could leave investors in the dark on opportunities with companies transitioning to forward-looking climate-change solutions. Our research process and additional ESG requirements allow us to pay close attention to the structure and culture of a company. And, our engagement with firms allows us to champion forward-looking ESG disclosures that meet investor needs, which in turn identifies potential opportunities in companies that are preparing to transition to a lower-carbon future. All investments involve risks, including potential loss of principal. The value of investments can go down as well as up, and investors may not get back the full amount invested. Stock prices fluctuate, sometimes rapidly and dramatically, due to factors affecting individual companies, particular industries or sectors, or general market conditions. Value securities may not increase in price as anticipated, or may decline further in value. To the extent a portfolio focuses on particular countries, regions, industries, sectors or types of investment from time to time, it may be subject to greater risks of adverse developments in such areas of focus than a portfolio that invests in a wider variety of countries, regions, industries, sectors or investments. Special risks are associated with foreign investing, including currency fluctuations, economic instability and political developments; investments in emerging markets involve heightened risks related to the same factors. 1.Source: Intergovernmental Panel on Climate Change, “Global Warming of 1.5 °C,” October 2018.